Advances in our understanding of the cellular and molecular mechanisms in rheumatic disease fostered the advent of the targeted therapeutics era. Intense research activity continues to increase the number of potential targets at an accelerated pace. In this review, examples of promising targets and agents that are at various stages of clinical development are described. Cytokine inhibition remains at the forefront with the success of tumor necrosis factor blockers, and biologics that block interleukin-6 (IL-6), IL-17, IL-12, and IL-23 and other cytokines are on the horizon. After the success of rituximab and abatacept, other cell-targeted approaches that inhibit or deplete lymphocytes have moved forward, such as blocking BAFF/BLyS (B-cell activation factor of the tumor necrosis factor family/B-lymphocyte stimulator) and APRIL (a proliferation-inducing ligand) or suppressing T-cell activation with costimulation molecule blockers. Small-molecule inhibitors might eventually challenge the dominance of biologics in the future. In addition to plasma membrane G protein-coupled chemokine receptors, small molecules can be designed to block intracellular enzymes that control signaling pathways. Inhibitors of tyrosine kinases expressed in lymphocytes, such as spleen tyrosine kinase and Janus kinase, are being tested in autoimmune diseases. Inactivation of the more broadly expressed mitogen-activated protein kinases could suppress inflammation driven by macrophages and mesenchymal cells. Targeting tyrosine kinases downstream of growth factor receptors might also reduce fibrosis in conditions like systemic sclerosis. The abundance of potential targets suggests that new and creative ways of evaluating safety and efficacy are needed. The development of new therapies for rheumatic diseases was mainly empiric until recently. Most of the drugs that we used until the 1990s, including standards like methotrexate, were originally discovered for other purposes or were accidentally noted to be beneficial in autoimmunity. As the molecular mechanisms of disease have been unraveled, newer targeted therapies have been a stunning success. Understanding the importance of cytokine networks in rheumatoid arthritis (RA) led to the biologics era with agents that block tumor necrosis factor (TNF), interleukin-1 (IL-1), and IL-6. These biologics are also effective in other diseases, including seronegative spondyloarthropathies, autoinflammatory syndromes, and perhaps gout. Despite notable achievements, currently available therapies are not effective in many patients with rheumatic diseases. The new biologics are ineffective in many individuals; in some situations, like systemic lupus erythematosus (SLE), no new effective therapies have been approved for decades. As our knowledge of disease pathogenesis expands, new pathways and mechanisms that can be exploited are emerging. In this review, we will discuss some promising targets that have arisen from recent research. Due to the breadth and depth of current research and space limitations, this is not an exhaustive review, but it does provide a taste of what is to come (Figure 1). 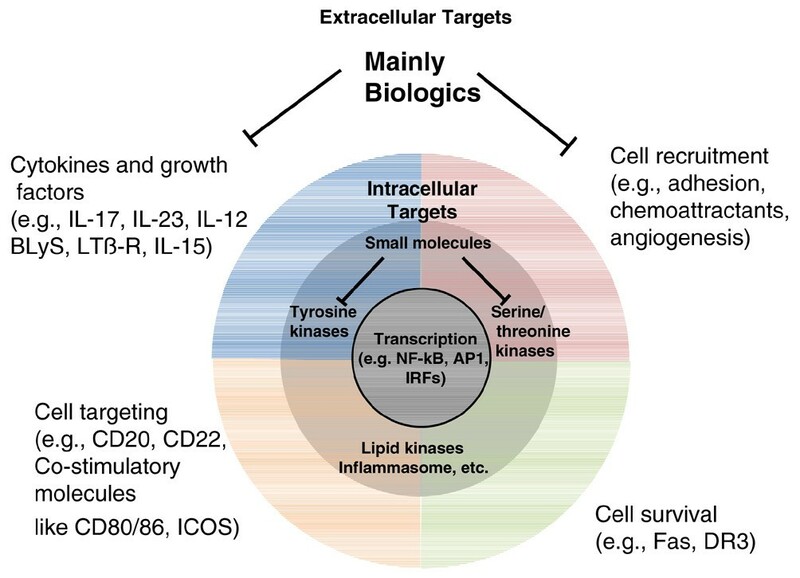 Intercellular molecules such as cytokines and their surface receptors can be targeted by biologics such as monoclonal antibodies, receptor-antibody fusion proteins, and, in some cases, small molecules. Intracellular enzymatic cascades convey the information from the cell surface to regulate the cell response, including transcriptional activity in the nucleus. Cell-permeable molecular compounds can block a specific kinase and transcription factors. Some surface receptors such as G-protein-coupled receptors represent another class of molecule that can be inhibited by small-molecule compounds. AP-1, activation protein-1; BLyS, B-lymphocyte stimulator; ICOS, inducible costimulator; IL, interleukin; IRF, interferon regulatory factor; LTβ-R, lymphotoxin beta receptor; NF-κB, nuclear factor-kappa-B. The most dramatic therapeutic advances in the 'modern' era of rheumatology have focused on anti-cytokine therapy. As the cytokine network becomes increasingly complex, new and exciting possibilities arise. In this section, a few key cytokine targets are discussed. Of the cytokines relevant to autoimmunity, IL-17 and its family have perhaps generated the most anticipation. In murine models of autoimmune disease, the Th17 subtype of T lymphocytes that produce IL-17 plays a pivotal role in pathogenesis . While the function of this factor in humans is less certain, it represents a unique T cell-derived factor that could participate in many rheumatic diseases. The IL-17 family comprises six members designated IL-17A through F, with perhaps the most important being IL-17A (which is the cytokine usually called 'IL-17'). IL-17A is found in the synovial fluids of some RA patients and can be detected in T cell-rich areas of RA synovial tissue [2, 3]. It, along with its closest homolog IL-17F, enhances the production of proinflammatory cytokines by fibroblast-like synoviocytes (FLS) and might amplify the effects of macrophage-derived cytokines such as TNF . Blockade of IL-17 with an antibody-based approach is very effective in collagen-induced arthritis (CIA) as well as many other models of inflammation . There are several ways to block IL-17 family members. Conventional methods, such as monoclonal anti-IL-17A antibodies, are currently being developed for RA and psoriasis as well as other autoimmune indications. Subunits of the IL-17 receptor complexes (IL-17RA and IL-17RC) could be used to design soluble antagonists that can bind multiple members, such as IL-17A and IL-17F. The results of IL-17-directed approaches are eagerly anticipated for a variety of indications, including RA and psoriasis. IL-12 and IL-23 are related cytokines that are secreted by macrophages and dendritic cells after cytokine or Toll-like receptor ligand stimulation. IL-12 is a key inducer of Th1 CD4+ T cells that produce interferon-gamma (IFN-γ), whereas IL-23 contributes to Th17 polarization. Thus, an IL-23-targeted therapy could potentially have a downstream effect on IL-17 production. When T cells are exposed to IL-23, the cells can be directed toward the Th17 phenotype. This is especially true in mice, in which exposure to IL-6 and transforming growth factor-beta (TGF-β) also contributes to Th17 cell production through the activation of STAT3 (signal transducer and activator of transcription 3) and induction of the transcription factor retinoic acid-related orphan receptor (RORγt). The system in humans is not as well defined and TGF-β might not contribute. Nevertheless, an IL-23-targeted therapy could potentially have a downstream effect by limiting the activation of Th17 cells and decreasing expression of IL-17 family genes. The interplay between IL-12 and IL-23 and autoimmunity can be complex; mice deficient in the IL-12 p35 subunit have increased severity of CIA . In contrast, mice lacking the p19 subunit of IL-23 are protected from CIA, as are p40 knockout mice, the subunit common to IL-12 and IL-23. Even though IFN-γ is the signature cytokine of Th1 cells and is pathogenic in some models of autoimmunity, including proteoglycan-induced arthritis, the IL-12/IFN-γ axis can also be protective in CIA and experimental allergic encephalomyelitis (EAE) . IFN-γ also blocks Th17 development and can potentially enhance regulatory T (Treg) cell response [8, 9]. Strategies that interfere with IL-17 production like IL-12/IL-23 inhibitors or IFNγ can potentially enhance the suppressive activity of Tcells and limit autoimmunity. Treg cell numbers can also increase with other cytokine modulators, such as infliximab . The apparent reciprocal relationship of Treg cells and Th17 cells provides a potential way to alter immune responses and restore homeostasis through cytokine modulation. IFN-γ is expressed at relatively low levels in the rheumatoid synovium and exerts anti-inflammatory effects in vitro and in some arthritis models . IFN-γ administration in RA shows minimal efficacy and caused disease exacerbation in multiple sclerosis. Patients could only tolerate a dose considerably lower than required to suppress arthritis in mouse models. Based on the results of clinical and preclinical studies, a selective IL-12-directed agent that interferes with Th1 cell differentiation without a major effect on Th17 cells might be less attractive. Mouse and human T-cell systems clearly differ in many respects, which makes extrapolation from murine models difficult . As noted above, TGF-β is critical for Th17 differentiation in the mouse but might be less important in human cells. A large percentage of human IL-17-positive T cells also produce IFN-γ. While blocking Th17 cells might be sufficient in mice, efficacy could require suppressing both the Th1 and Th17 pathways in humans. This approach could involve interfering with IL-23, which is required by Th17 cells for effector function. IL-23 p19 levels were higher in RA than osteoarthritis synovial fluids in one study . However, another group detected low levels of heterodimeric bioactive IL-23 in only a fraction of RA synovium samples . A monoclonal antibody against p40, the subunit common to IL-12 and IL-23, showed remarkable efficacy and a favorable safety profile in inflammatory bowel disease and psoriasis [15–17]. The results of a placebo-controlled phase II study in psoriatic arthritis are also available. Patients were treated every week for 4 weeks and received two other injections at weeks 12 and 16. ACR20 (American College of Rheumatology 20% improvement criteria) responses at 12 weeks were achieved in 42% of patients compared with 14% in the placebo group. ACR50 and 70 responses were also statistically significant (25% versus 7% and 10% versus 0%, respectively) . The small molecule STA-5326 is being evaluated in a phase II trial in RA. In vitro, this compound blocks IL-12, IL-23, and IFN-γ production by cultured peripheral blood mononuclear cells, although the mechanism is not well established. In an open-label study, STA-5326 decreased clinical activity scores in Crohn disease patients. The clinical trials might help investigators to understand the role of the IL-12/IL-23 axis in different forms of human autoimmune disease. Elevated levels of IL-15 are expressed in the synovium of RA patients and have been implicated as a mediator of TNF production by macrophages . This cytokine can also participate in joint inflammation by attracting neutrophils and T lymphocytes and by triggering the proliferation of memory CD8+ T cells. IL-15 can be bound to the plasma membrane or secreted, while a shorter isoform remains intracellular. The IL-15 receptor complex is trimeric and comprises the γ subunit (shared with IL-2, IL-4, IL-7, IL-9, and IL-21) and IL-2/15 β chains (shared with IL-2). The IL-15R α chain confers specificity toward IL-15. A human monoclonal antibody that binds IL-15 showed a modest ACR20 response in a phase II clinical trial at the highest dose, supporting a possible contribution of IL-15 in RA. These preliminary results are encouraging, although a second study failed to show significant benefit. Elevated levels of BAFF/BLyS (B-cell activation factor of the TNF family/B-lymphocyte stimulator) and APRIL (a proliferation-inducing ligand) are found in the serum of patients with RA, SLE, and Sjögren syndrome. These two cytokines are members of the TNF superfamily and are expressed by various cell types, including monocytes, dendritic cells, osteoclasts, and synoviocytes . Both bind to receptors expressed on B cells, known as BCMA (B-cell maturation protein) and TACI (transmembrane activator and CAML interactor). BAFF receptor 3 (BR3) recognizes only BAFF/BLyS. These molecules perform similar functions in B-cell development and survival, Ig class switch, and costimulation. Several different biologic strategies to block BAFF/BLyS and APRIL are being developed. Belimumab is a fully humanized anti-BAFF antibody that showed minimal efficacy in a phase II trial in RA . Belimumab was also evaluated in a phase II study in patients with active SLE. It failed to meet its primary endpoint, but subgroup analysis suggested that it might improve or stabilize disease activity in some patients . One potential problem with belimumab is that it does not block APRIL and hence might not have sufficient effect on B-cell maturation. TACI-Ig is designed to function as a decoy receptor with both anti-BLyS and anti-APRIL activity. Another agent, the BAFF receptor-Ig fusion protein, inhibits only BAFF. TACI-Ig is being evaluated in RA and SLE, and preliminary studies suggest that there is a significant decrease in serum immunoglobulins. Anti-BR3 antibodies with cell depletion activity and BR3-Fc are being developed for similar indications [21, 23]. The respective merits of strategies involving BLyS and APRIL are difficult to compare because their respective roles in humans are not yet fully understood. The lymphotoxin (LT) system is also part of the TNF superfamily and includes lymphotoxin-related inducible ligand that competes for glycoprotein D binding to herpes virus entry mediator on T cells (LIGHT), LTα, and LTβ . All three ligands can bind the LTβ receptor (LTβR) and can participate in the development of the immune system and lymphoid organization. LTα also binds to the TNF receptors and its function is blocked by etanercept. In addition, LIGHT binds to another receptor, herpes virus entry mediator (HVEM). The LIGHT-HVEM interaction is proinflammatory, but HVEM also binds the B- and T-lymphocyte attenuator (BTLA), which suppresses immune responses. Decoy receptors designed by linking the LTβR with the Ig Fc domain selectively inhibit the proinflammatory functions of the LT system. This strategy is effective in many animal models of autoimmunity, including CIA, EAE, and murine models of SLE and diabetes . LTβR signaling is required to develop and maintain tertiary lymphoid structures but is dispensable for many aspects of secondary lymphoid organ biology in adults. In RA, lymphoid structures are seen in the synovium of up to 30% of patients. LTβR-Ig therapy might be especially effective in this subpopulation if these structures play a critical role in local antigen presentation and disease pathogenesis . In addition, synoviocytes can respond to LIGHT, LTα, and LTβ with the release of proinflammatory mediators. Early results from RA patients treated with LTβR-Ig have demonstrated some benefit, although a larger study reportedly did not demonstrate sufficient efficacy to warrant continued development for RA. However, other autoimmune diseases, such as SLE, are additional indications that could be evaluated with this molecule. Careful monitoring of host defense will also be needed given the important role of LTβ in germinal center organization. Inflammatory and immune cell recruitment to target tissue is a hallmark of autoimmune diseases. This process is regulated by a class of proteins called chemokines as well as many small-molecule chemoattractants . More than 40 chemokines have been identified and many can bind to more than one receptor. In addition, about half of the 20 chemokine receptors, which are 7-transmembrane G-protein coupled receptors (GPCRs), recognize multiple chemokines. Which chemokine or receptor to block in a particular disease remains a difficult question, and targeting individual chemokines has not been fruitful due to redundancy in the system. On the other hand, blocking GPCR chemokine receptors by synthesizing small-molecule inhibitors that block the interaction of multiple chemokines with an individual receptor has been more encouraging. The chemokine/receptor pairs CXCL13/CXCR5, CCL21/CCR7, and CXCL12/CXCR4 contribute to the formation of ectopic lymphoid structures that are found in most autoimmune diseases and could be targeted for autoimmunity. CCR5, CCR2, and CCR1 are implicated in RA and might be involved in recruitment to inflammatory sites like synovium. Inhibition of CCR1 and CCR2 was not effective in RA . The results for the CCR1 antagonist were somewhat surprising in light of a synovial biopsy study suggesting that synovial macrophages were depleted. CCR2 is a more complex chemokine, and the effect of CCR2 deficiency or CCR2 inhibitors in animal models varies depending on the model. This approach is especially interesting in humans because CCR2 (along with CCR6) is a key receptor expressed by human Th17 cells . The failure of CCR1 and CCR2 antagonists could be related to pharmacokinetic issues, lack of pathological relevance of these targets, or redundancy in the receptor system. CCR5 received considerable attention when it was discovered that individuals with a deletion in this gene are protected from HIV viral entry. Epidemiologic studies also suggest that the CCR5 deletion could decrease severity of RA, although this is controversial. A small-molecule inhibitor of CCR5 is now approved for patients with HIV. CCR5 is expressed on T cells and macrophages and binds to the inflammatory chemokines MIP-1α (macrophage inflammatory protein-1-alpha) and RANTES (regulated on activation normal T cell expressed and secreted) that are highly expressed in RA. Blocking CCR5 provides protection from arthritis in the CIA model . Phase II clinical trials with CCR5 inhibitors are in progress for RA. Many other chemokines have been considered targets for rheumatic diseases. For instance, stromal derived factor-1 is a potential target and is relatively simple to block since, unlike many other chemokines, it has only a single receptor (CXCR4). Chemokines play a role in the organization of lymphoid structures, which are required for antigen presentation and germinal center formation. Disrupting this network by interfering with dendritic cell-derived chemokines, such as CXCL13 or CCL21, could achieve this goal, as could blocking cytokines like LTβ (see above). A detailed description of the myriad of approaches designed to interfere with immune cell recruitment by blocking either cell adhesion or angiogenesis is beyond the scope of this short review. However, the success of the anti-α4/β1 integrin antibody in multiple sclerosis suggests that it might be useful in other autoimmune diseases that involve recruitment of T cells. Balancing the relative risks of decreased host defense (for example, progressive multifocal leukoencephalopathy [PML]) with potential benefit will be a significant challenge. Approaches that target the β2 integrins, which play a key role in neutrophil recruitment, are very effective in preclinical models but raise significant concerns about crippling host defense. Similarly, angiogenesis inhibitors like anti-vascular endothelial growth factor in cancer and preclinical data suggesting that new blood vessels contribute to inflammation suggest that this approach might be applicable to rheumatic diseases. Selective inhibitors of proliferating endothelial cells, such as AGM-1477 (a derivative of fumagillin), show impressive anti-inflammatory effects in several animal models of inflammatory arthritis. The efficacy of rituximab, a chimeric anti-CD20 monoclonal antibody, in RA opened up the potential for B cell-directed therapy in rheumatic diseases. The antibody was initially developed to deplete malignant B cells in lymphoma patients by virtue of CD20 expression on mature B cells, but not B-cell precursors or plasma cells. Rituximab causes a prolonged depletion in circulating B lymphocytes in the blood. CD20+ synovial B cells are variably reduced and this is associated with a decrease in synovial immunoglobulin synthesis, especially in ACR50 responders . Clinical response was associated with a decrease in synovial plasma cells in another study . Rituximab contains chimeric mouse-human sequences that might be responsible for some infusion reactions. Human or humanized anti-CD20 antibodies, like ocrelizumab and ofatumumab, are being developed to mitigate this problem . Smaller versions of monoclonal antibodies combine one binding domain, one hinge domain, and one effector domain into a single-chain polypeptide. This new class of drug, known under the acronym SMIP (small modular immuno-pharmaceutical), is also being developed. Although multiple case reports and open-label studies suggested a benefit of rituximab in SLE patients, the drug did not demonstrate clinical efficacy in the randomized phase II/III EXPLORER trial. The results of another study for lupus nephritis are anticipated. Case reports of fatal PML in severely immunocompromised lupus and cancer patients who received anti-CD20 antibody necessitate careful individual evaluation of the risks and benefits of off-label use. CD22 is a B cell-specific surface molecule involved in B-cell antigen receptor signaling. A humanized antibody against this regulatory molecule showed modest efficacy in lupus patients in a randomized phase II study . An average reduction of peripheral B cells of 30% can persist up to 12 weeks. Additional regulatory mechanisms, including inhibition of B-cell proliferation, could contribute to the therapeutic activity of this molecule. CTLA4 is an inducible T-cell surface molecule that inhibits costimulation signaling induced by CD28 engagement with CD80/CD86. Abatacept, a CTLA4-Ig fusion molecule, blocks the interaction between CD80/86 and CD28 and is effective in RA. The success of this approach contrasts with the failure of previous T cell-depleting strategies, such as anti-CD4 antibodies, perhaps because CD4 is also expressed on Treg cells that can suppress inflammatory arthritis. Other costimulatory molecules are also potential therapeutic targets, although the preclinical data are complex. For instance, blockade of the inducible costimulator (ICOS) is therapeutic in CIA but augments disease in diabetes and some multiple sclerosis models . Subtle differences between human and animal proteins, such as Fc receptors, might contribute to the catastrophic cytokine release syndrome caused in human volunteers by the CD28 superagonist TGN1412 . Nonetheless, the CD80/86-CD28 family remains a promising field for new therapeutic interventions. The interaction between CD40 and CD40 ligand is also attractive, although anti-CD40 ligand antibodies in SLE were complicated by thrombotic disease. Targeting CD40 instead might avoid the activation of platelets, which express CD40 ligand. FLS are present on the synovial intimal lining. They contribute to the pathogenesis of RA by virtue of their ability to produce cytokines (especially IL-6), metalloproteinases, and small-molecule mediators of inflammation like prostaglandins. Selective targeting of FLS has been difficult until recently, when a relatively unique marker, cadherin-11, was identified as a key protein involved with homoaggregation of synoviocytes in the lining layer of normal synovium . Preclinical models suggest that cadherin-11 blockade disrupts the synovial lining, decreases joint inflammation, and suppresses cartilage damage. This approach is interesting because it could potentially be used in combination with immunomodulatory agents without an adverse effect on host defense. Inducing or enhancing synovial cell death, especially FLS, is another approach that could be beneficial in inflammatory arthritis. A number of therapies have been considered and demonstrate preclinical efficacy, including using anti-Fas antibodies to induce apoptosis or enhancing expression of intracellular genes like Bim or PUMA (p53 upregulated modulator of apoptosis) [35, 36]. Because the mechanisms of cell death are shared by many cell types, selectively inducing apoptosis in FLS or in the joint can be difficult. Thus, methods to target the synovium selectively might be required. Intracellular signaling pathways transmit environmental information to the cytoplasm and the nucleus, where they regulate cellular responses and gene transcription. Understanding the hierarchy and pathogenic significance of these pathways in autoimmunity has led to the development of compounds that block several promising targets [37, 38]. Orally bioavailable small-molecule inhibitors are currently the most likely approach, although biologics like small interfering RNA and genes that express dominant negative kinases are also possible. It is likely that the small-molecule approach, though still in its infancy, will advance rapidly over the next decade. If successful, these small compounds could augment or replace more expensive parenteral biologics that are currently the mainstay of treatment. Several hurdles still need to be overcome, including improved compound specificity and the importance of many key pathways for homeostasis and host defense . Mitogen-activated protein (MAP) kinases are stress-activated serine/threonine kinases that include the p38, ERK (extra-cellular regulating kinase), and JNK (c-Jun-N-terminal kinase) (Figure 2) families. This complex family regulates both cyto-kine production and cytokine responses in a variety of rheumatic diseases. Partially overlapping activation signals converge on each kinase pathway, which in turn regulate a number of downstream events such as transcription factor activation, cell migration, and proliferation . 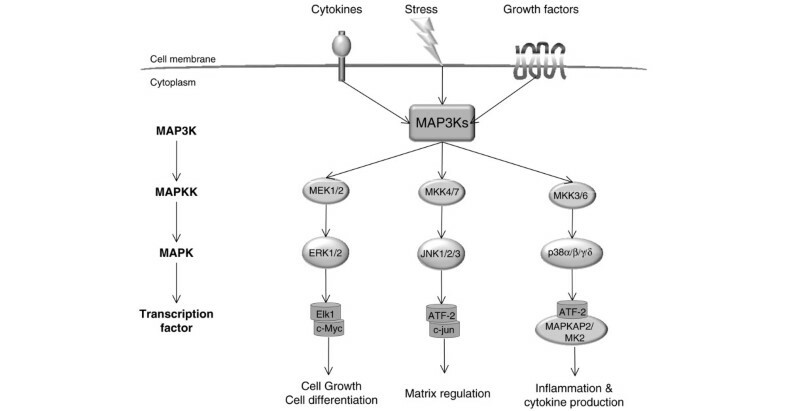 The mitogen-activated protein kinase (MAPK) signaling cascade. The MAPKs form an interacting cascade of signaling enzymes that orchestrate responses to extracellular stress, such as inflammation, infection, and tissue damage. 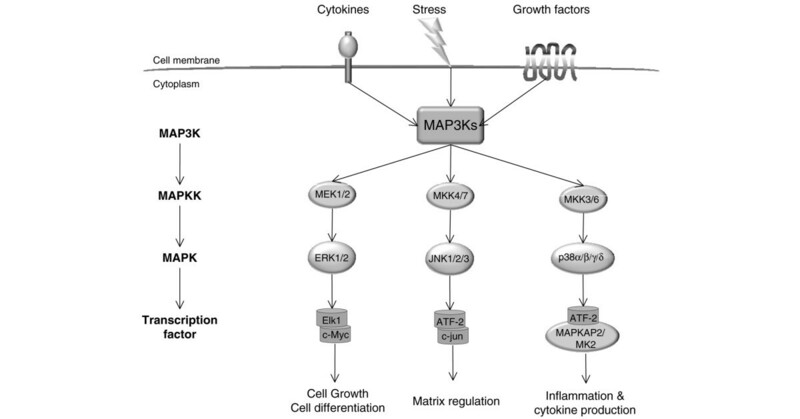 The three main families (ERK, JNK, and p38) have overlapping functions but tend to regulate cell growth, matrix turnover, and cytokine production, respectively. The cascade generally has three levels (shown on the left), including the MAP kinase kinase kinases (MAP3Ks), which activate the MAP kinase kinases (MAPKKs or MKKs), which, in turn, activate the MAPKs. Drug development efforts thus far have focused on p38 and MEK1/2 for rheumatic diseases. JNK inhibitors are effective in preclinical models and are also being developed for cancer. ATF2, activating transcription factor-2; ERK, extracellular signal related kinases; JNK, c-Jun N-terminal kinase; MAPKAPK, mitogen-activated protein kinase-activated protein kinase; MEK1/2, mitogen-activated protein kinase kinases. Drug development efforts in the MAP kinase family have led to the synthesis of several p38 inhibitors. This kinase regulates the production of inflammatory cytokines and chemo-kines in response to TNF or IL-1 in most inflammatory cell types. p38 inhibitors are effective in preclinical models of arthritis and several have advanced into clinical trials [39, 40]. The availability of phase II trial results in RA is limited but they suggest, at best, modest benefit in RA. One major issue that affects the development of some p38 inhibitors is dose-dependent toxicity. Structurally distinct compounds have caused hepatoxicity, which might indicate that this side effect is target-based. In another phase II trial, the p38 inhibitor VX-702 caused Q-T prolongation. Based on the number of compounds that have been tested, it is clear that targeting p38 will not be as simple as hoped. Several potential alternatives have emerged in recent years, including downstream (MK2) or upstream (MKK3 or MKK6) kinases that are involved in the p38 biology [41, 42]. These strategies could potentially provide some of the benefit of modulating p38 signaling while preserving other essential functions and ameliorate the side-effect profile. JNK and ERK inhibitors for rheumatic disease are less advanced. JNK controls activator protein-1 (AP-1)-dependent genes, including matrix metalloproteinases (MMPs), and animal studies with JNK inhibitors showed protection from bone damage . However, the available JNK inhibitors have not been developed for rheumatic diseases yet and could have issues related to potency and selectivity. MKK7, an upstream activator of JNK, is the main kinase required for JNK activation after cytokine stimulation of FLS . Since cellular stress events can bypass MKK7 and use MKK4 to stimulate JNK, targeting MKK7 could be safer than broad-acting JNK inhibitors. Targeting the downstream transcription complex AP-1, such as with decoy oligonucleotides, is another alternative to focusing on JNK. AP-1 consists of dimers that include members of the Jun, Fos, and activating transcription factor protein families that together control a large number of genes, including MMPs and inflammatory cytokines. c-Fos-deficient mice lack osteoclasts and are protected from bone erosions but not inflammation in the TNF transgenic model . A small molecule with anti-AP-1 activity was effective in CIA . Interestingly, this compound also decreased IL-1 levels and joint inflammation, an indication that it had a pronounced effect on AP-1-driven transcription. No significant toxicity was reported during animal testing but this will require careful evaluation in human studies. ERK plays a major role in the regulation of cell growth and could be an important therapeutic advance in cancer. ERK inhibitors are also effective in some preclinical models of arthritis . The small-molecule inhibitor MEK1/2 (ARRY-162), which is the upstream kinase that regulates ERK, inhibits ex vivo production of IL-1, TNF, and IL-6 by human whole blood after administration to healthy volunteers . Similar to other MAP pathway inhibitors, however, toxicities (including skin rash and visual changes) have emerged due to the ubiquitous role of ERK. It might be more desirable to modulate, rather than block, these pathways by careful selection of pharmacokinetic profiles and judicious dosing. Tyrosine kinases are divided into two groups. Cytoplasmic kinases transduce signals from a separate surface receptor while receptor tyrosine kinases have intrinsic tyrosine phosphorylation activity. The four Janus kinases (JAKs) are cytoplasmic tyrosine kinases that pair in at least six different combinations to integrate signaling from nearly 40 different cytokines and growth factors . Cytokine receptors that comprise the common γ-chain subunit use JAK1 and JAK3 to respond to cytokines involved in RA, such as IL-6, IL-2, IL-12, or IL-15. JAKs then activate STAT proteins that translocate to the nucleus and control the expression of downstream targets. Selective inhibitors of JAK are now in clinical studies for the treatment of RA and psoriasis . The small molecule CP-690,550 inhibits JAK3, with less inhibition of JAK1 and JAK2. JAK3, which is mainly expressed in hematopoietic cells, pairs with JAK1 and signals downstream of IL-2, IL-4, IL-7, IL-9, IL-15, and IL-21 . Initially developed as an immuno-suppressive, the compound demonstrated clinical efficacy in an early phase II trial with excellent ACR responses: CP-690,550 ACR50 33% to 54% versus placebo ACR50 6% . Mechanism-based side effects were observed, including in the hematopoietic system. Neutropenia was reported at the highest dose. As a T-cell immunomodulator, this compound could have utility in a variety of autoimmune diseases assuming that the safety profile permits further development. INCB018424, an inhibitor of JAK1, JAK2, and Tyk2 with IC50 (half inhibitory concentration) values of 2.7, 4.5, and 19 nM, respectively, is also in clinical development for RA and psoriasis. This inhibitor could indirectly affect JAK3, which needs to pair with JAK1 for most of its effects . Tyk2 mediates type I IFN, IL-12, and IL-23 signaling . A preliminary study that enrolled six active RA patients during 28 days showed a favorable clinical outcome without significant adverse events, using a controlled dosage to inhibit JAK1 and JAK2 but not Tyk2. The long-term safety of this powerful immunosuppressive approach must be carefully evaluated. The known complications of severe immuno-deficiency in humans bearing JAK mutations suggest that the development will need to be cautious. Spleen tyrosine kinase (Syk) also belongs to the intracellular tyrosine kinase family. Syk is expressed in B cells, mast cells, neutrophils, macrophages, platelets, and nonhematopoietic cells, including FLS. The molecular signaling events in the Syk cascade are best defined in hematopoietic cells. Syk binds to phosphorylated activated ITAMs (immunoreceptor tyrosine-based activation motifs) that are part of immuno-receptors such as the B-cell receptor, T-cell receptor, or FcR. ITAM-Syk signaling is also triggered by integrins during cell adhesion and migration via ITAM-dependent or -independent mechanisms . Less is known about Syk signaling pathways in nonhemato-poietic cells. ITAM consensus motifs are found in a number of molecules unrelated to classical immunoreceptors, and ITAM-independent mechanisms could also be engaged . In synovial fibroblasts, Syk regulates the MAP kinase cascade, especially JNK-regulated genes such as IL-6 and MMP-3 . Syk inhibition was able to suppress inflammation and joint destruction in a rat CIA model . Treatment with tamatinib fosdium (R788), an oral Syk inhibitor, led to significant improvement in RA patients . Syk is also an interesting target in SLE, in which part of the overactive T-cell phenotype is thought to be caused by the abnormal association of Syk with the T-cell receptor instead of the ζ chain Zap70. A Syk inhibitor was therapeutic and preventive in a model of murine renal lupus . Imatinib mesylate was the first successful clinical application of a therapeutic designed to target tyrosine kinases. It is currently approved for several oncologic indications, including chronic myelogenous leukemia and systemic masto-cytosis. Imatinib is a potent inhibitor of platelet-derived growth factor (PDGF) receptor, c-kit (the receptor for stem cell factor, a growth factor for hematopoietic cells and mast cells), and the proto-oncogene c-Abl. Thus, the compound inhibits a spectrum of signal induction pathways relevant to inflammation and fibrosis, including PDGF signaling in synoviocytes, mast cell c-kit signaling, and TNF production by synovial fluid mononuclear cells. Imatinib is active in murine CIA, supporting its development in inflammatory arthritis . Case reports indicate that it might be beneficial in refractory cases of RA, but the results of a controlled study have not been reported . c-Abl also can participate in the profibrotic effects of TGF-β signaling. For instance, patients receiving imatinib for chronic myelogenous leukemia experienced marked improvement in myelofibrosis . Several studies in animal models and clinical case reports in various conditions confirm that imatinib is a promising therapeutic for fibrotic disorders such as scleroderma, pulmonary fibrosis, or nephrogenic systemic fibrosis [62, 63]. Both benefits and side effects of kinase inhibitors are often observed because of structural similarities between enzymes, especially in the ATP site where most small compounds bind. Lack of selectivity might provide a therapeutic advantage in complex diseases such as RA, in which more than one molecular pathway contribute to the pathogenesis. On the other hand, it also increases the risk of side effects. Long-term studies of imatinib for the treatment of cancer patients show that severe adverse events occur in more than a third of patients, mostly within the first 2 years . Therefore, careful risk-benefit analysis will be required for all of these new kinase inhibitors. Several phosphatidylinositol 3-kinase (PI3K) inhibitors have entered clinical trials in different fields, including oncology, cardiology, and autoimmunity. Class I PI3Ks are a family of intracellular signaling proteins involved in many aspects of cell biology, including adaptive and innate immunity . They are composed of heterodimers assembled from five different regulatory subunits that pair with four different catalytic subunits (α, β, γ, and δ). Activation of PI3Ks generates the key lipid second messenger phosphatidylinositol (3,4,5)-trisphosphate (PIP3). The α, β, and δ subunits are associated mainly with receptor tyrosine kinases, whereas γ subunits signal to GPCRs such as chemokine receptors. This dichotomy is not absolute and there are additional specificities depending on the cell type examined. PI3Kα and β are expressed in most cell types, which is, in part, why cancer has been a primary drug development pathway. PI3Kδ and γ are present mainly in hematopoietic cells, suggesting that they will be better targets for therapeutic intervention in autoimmune diseases . Mice lacking PI3Kγ have altered signaling in T cells, macrophages, neutrophils, and mast cells. This particular kinase is a key convergence point for many chemokine receptors. Therefore, a PI3Kγ inhibitor could potentially block chemokine function more effectively than targeting individual receptors. PI3Kδ-deficient mice have more subtle defects in neutrophil signaling and T-cell activation but have impaired B-cell functions. Interestingly, migration to the bacterial product fMLP (N-formyl-methionyl-leucyl-phenylalanine) remains intact in PI3Kδ-deficient cells while it is impaired after PI3Kγ blockade. Preclinical data show that PI3Kδ and γ inhibition can decrease the severity of arthritis either separately or in combination, the latter leading to a synergistic effect [67, 68]. In addition, PI3Kγ deficiency decreases disease activity in murine lupus models . The array of potential therapeutic targets described above is impressive but still represents only a small part of the spectrum (Table 1). There are many other therapeutic targets with great potential merit, and space limitations prevent a detailed discussion of each one. This cornucopia of targets includes other approaches that can modulate cytokines (for example, adenosine A3 receptors), proteases (for example, collagenases), ion channels (for example, P2X7 receptor), and innate immune responses (for example, IFNs and Toll-like receptors). Time will tell whether one of these pathways or the ones described in more detail above will lead the way to the next generation of therapeutics. Identifying possible targets is no longer the major hurdle; rather, prioritizing potential drugs among limited patient populations, using novel study designs in an era when placebo-controlled studies have become increasingly difficult, and using genomic and biomarker data to predict clinical response and toxicity are key issues that will need to be addressed. Nevertheless, our new molecular understanding of human disease will likely lead to a pipeline of breakthrough therapies over the coming years that will improve survival and quality of life for our patients. Completed phase III in RA. Phase III for sJIA. Insufficient efficacy in phase II (RA). Phase I in RA, psoriasis, and others. Phase II for psoriatic arthritis. Lack of efficacy in RA. Phase III in SLE. Lack of efficacy in RA for LTβ (phase II). Phase II in RA, SLE. Decreased erosions in RA (phase II). Phase I/II in RA and transplant. Phase II in RA, ankylosing spondylitis, Crohn disease, and other inflammatory diseases. Phase II in RA and scleroderma. Many other compounds and targets not listed are also being evaluated. Suffixes: -cept, receptor-antibody fusion protein; -umab, human monoclonal antibody; -zumab, humanized monoclonal antibody. APRIL, a proliferation-inducing ligand; BAFF, B-cell activation factor of the tumor necrosis factor family; BLyS, B-lymphocyte stimulator; ERK, extracellular regulating kinase; GPCR, G-protein coupled receptor; IL, interleukin; JAK, Janus kinase; LIGHT, lymphotoxin-related inducible ligand that competes for glycoprotein D binding to herpes virus entry mediator on T cells; LT, lymphotoxin; mAb, monoclonal (therapeutic) antibody; MEK, mitogen-activated protein kinase; P13K, phosphatidylinositol 3-kinase; PDGF-R, platelet-derived growth factor receptor; RA, rheumatoid arthritis; RANKL, receptor activator of nuclear factor-kappa B ligand; sJIA, systemic juvenile idiopathic arthritis; SLE, systemic lupus erythematosus; SMIP, small modular immunopharmaceutical; Syk, spleen tyrosine kinase. Supported in part by NIH grants AI067752, AI070555, and AR47825.